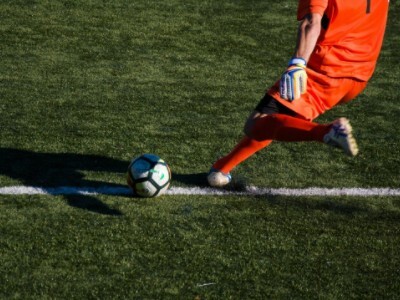 Strains of the hamstrings, which are a group of three muscles located in the back of the thigh, are the most common injuries that occur in soccer players. Making matters even worse is the fact that after experiencing a first hamstring strain, about one-third of players will go on to have another hamstring injury within a few weeks of returning to play. This high rate of re-injury may be either due to players not taking enough time to completely heal before returning or because their rehabilitation program was not sufficient. It is therefore important to ensure that the rehab programs used are as effective as possible for reducing the risk for future hamstring strains. One possible way to accomplish this is to use a treatment algorithm consisting of an ordered sequence of steps, where each step depends on the success of the previous step and is based on how each patient responds. With this in mind, a powerful study called a randomized-controlled trial (RCT) was conducted to evaluate the effect of this algorithm on the risk of hamstring strains in soccer players. Soccer players in Spain who had recently experienced a hamstring strain were invited to participate, and a total of 48 individuals were accepted and completed the RCT. These individuals were then randomly assigned to either the rehabilitation algorithm (RA) group or the rehabilitation protocol (RP) group and began treatment five days after their injury. Both rehab programs were performed and controlled by a physical therapist, but they were each structured in different ways. Patients in the RP group completed a program that consisted of hamstring exercises plus a general rehab and progressive running program, which was completed on a daily basis. After each participant was pain-free, they performed a test to determine if they were eligible to return to soccer, and if they failed, the rehab program was extended. The RA group followed a rehab program based on an algorithm, which only allowed patients to proceed to the next step if certain criteria were met. There were two parts of this program, with the first consisting of exercises designed to correct different risk factors related to hamstring injuries. The second part consisted of sprint training, strength training and manual therapy, and running sessions were also performed throughout. All participants were monitored for six months and any additional injuries they experienced were recorded. Results showed that over six months, the soccer players in the RA group experienced substantially fewer hamstring strain injuries than those in the RP group, especially in the early period when most of these injuries occur. In addition, the amount of time needed to return to sports was slightly shorter in the RP group, but the RA group experienced more substantial improvements of their performance in a sprint test. These findings suggest that an algorithm for rehabilitating hamstring strain injuries may be the better strategy for reducing the risk for future injuries while also improving players' performance. Individuals who are dealing with a hamstring strain should therefore consider seeing a physical therapist and following a similar rehab program to increase their chances of returning to sports appropriately with a lower risk for future hamstring injury.